The priests of ancient Babylonia and Egypt were also pioneer astronomers. They studied the heavens, mapped their constellations, identified the path of the Sun and estimated the periods of the Moon and Sun as they moved across the sky. But it was a Greek astronomer, Hipparchus of Nicea, who made the first major new discovery in astronomy. Comparing observations more than a century apart, Hipparchus proposed that the axis around which the heavens seemed to rotate shifted gradually, though very slowly. Viewed from Earth, the Sun moves around the ecliptic, one full circuit each year. Twice a year, at equinox, day and night are equal and the Sun rises exactly in the east and sets exactly in the west. Ancient astronomers had no good clocks and could not tell when the day and night had the same length, but they could identify the equinox by the Sun rising in the east and setting in exactly the opposite direction. At those times the Sun's position is at one of the intersections between the ecliptic and the celestial equator. Around the year 130 BC, Hipparchus compared ancient observations to his own and concluded that in the preceding 169 years those intersections had moved by 2 degrees. How could Hipparchus know the position of the Sun among the stars so exactly, when stars are not visible in the daytime? By using not the Sun but the shadow cast by the Earth on the moon, during an eclipse of the Moon! During an eclipse, Sun, Earth and Moon form a straight line, and therefore the center of the Earth's shadow is at the point on the celestial sphere which is exactly opposite that of the Sun. "The Dawning of the Age of Aquarius"
Hipparchus concluded that the intersection marking the equinox slowly crept forward along the ecliptic, and called that motion "the precession of the equinoxes. " The rate is about one full circle in 26 000 years. In ancient times the intersection marking the spring equinox was in the constellation of Aries, the ram, and for that reason the intersection (wherever it might be) is still sometimes called "the first point in Aries." Around the year 1 it moved into the constellation of Pisces (pronounced "pie-sees" in the US) and currently it is again in transition, to the constellation of Aquarius, the water carrier. If you ever heard the song "The dawning of the age of Aquarius" from the musical show "Hair," that is what it is all about. To astronomers precession is mainly another factor to be taken into account when aiming a telescope or drawing a star chart; but to believers in astrology, the "dawning of the age of Aquarius" is a great portent and may mark the beginning of a completely new and different era. What does this motion tell us about the Earth's motion in space? If you ever had a spinning top, you know that its axis tends to stay lined up in the same direction--usually, vertically, though in space any direction qualifies. the surface of a cone. Give it a nudge, however, and the axis will start gyrating wildly around the vertical, its motion tracing a cone (drawing). The spinning Earth moves like that, too, though the time scale is much slower--each spin lasts one day, but each gyration around the cone takes 26 000 years. The axis of the cone is perpendicular to the plane of the ecliptic. The cause of the precession is the equatorial bulge of the Earth, caused by the centrifugal force of the Earth's rotation (the centrifugal force is discussed in a later section). That rotation changes the Earth from a perfect sphere to a slightly flattened one, thicker across the equator. The attraction of the Moon and Sun on the bulge is then the "nudge" which makes the Earth precess. Through each 26 000-year cycle, the direction in the sky to which the axis points goes around a big circle, the radius of which covers an angle of about 23.5°. The pole star to which the axis points now (within about one degree) used to be distant from the pole, and will be so again in a few thousand years (for your information, the closest approach is in 2017). Indeed, the "pole star" used by ancient Greek sailors was a different one, not nearly as close to the celestial pole. Because of the discovery mady by Hipparchus, the word "precession" itself no longer means "shift forward" but is now applied to any motion of a spin axis around a cone--for instance, the precession of a gyroscope in an airplane's instrument, or the precession of a spinning satellite in space. Precession of a spinning scientific payload (also known as its "coning"--from "cone"--or its "nutation") is an unwelcome feature, because it complicates the tracking of its instruments. To eliminate it, such satellites use "nutation dampers," small tubes partially filled with mercury. If the satellite spins as it was designed to do, the mercury merely flows to the part of the tube most distant from the spin axis, and stays there. However, if the axis of rotation precesses, the mercury sloshes back and forth in the tube. Its friction then consumes energy, and since the source of the sloshing is the precession of the spin axis, that precession (very gradually) loses energy and dies down. Some 2000 years after Hipparchus, in the year 1840. Louis Agassiz, a Swiss scientist, published a book on glaciers, a familiar feature of his homeland--huge rivers of ice created by accumulated snowfall, filling valleys and slowly creeping downwards to their end points, lakes of meltwater (or, in some other countries, the sea). Glaciers leave an imprint on the landscape: they scratch and grind down rocks, and carry loads of gravel, at times even big boulders, from the mountains to the plains, leaving them far from their origins, wherever the ice finally melts. Agassiz, who later became a distinguished professor at Harvard, noted that such imprints existed all over northern Europe, and suggested that the lands now inhabited by Germans, Poles, Russians and others used to be covered by enormous glaciers. America, too, had its glaciers; Cape Cod, for instance, is a left-over pile of glacial gravel. 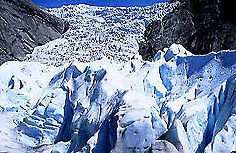 Later geological studies found evidence that such glaciers advanced and retreated several times in the last million years. The last retreat, a rather abrupt one, occured about 12,000 years ago. The big questions are, of course, what causes such giant glaciers, and will it happen again? Actually, no one is yet completely sure. But an intriguing idea, due to work in the 1930s by the Serbian astronomer Milutin Milankovich, may link them to the precession which Hipparchus discovered. As already noted, the Earth's orbit is not perfectly round, but is slightly elongated. The Earth therefore comes closest to the Sun in the first week of January (the exact day varies a little). It means that just when the northern hemisphere experiences winter and receives the least amount of sunlight, the Earth as a whole receives the most (the swing is about 3%, peak to peak). This makes northern winters milder, and northern summers are milder too, since they occur when the Earth is most distant from the Sun. The opposite is true south of the equator: the beginning of January occurs there in summer, and therefore one expects southern summers to be hotter, and southern winters colder, than those north of the equator. This effect is however greatly weakened, because by far most of the the southern hemisphere is covered by ocean, and the water tempers and moderates the climate. Right now, northern winter occurs in the part of the Earth's orbit where the north end of the axis points away from the Sun. However, since the axis moves around a cone, 13,000 years from now, in this part of the orbit, it will point towards the Sun, putting it in mid-summer just when the Earth is closest to the Sun. At that time one expects northern climate to be more extreme, and the oceans then have a much smaller effect, since the proportion of land in the northern hemisphere is much larger. Milankovich argued that because winters were colder, more snow fell, feeding the giant glaciers. Furthermore, he said, since snow was white, it reflected sunlight, and with more severe winters, the snow-covered land warmed up less effectively once winter had ended. Climate is maintained by a delicate balance between opposing factors, and Milankovich argued that this effect alone was enough to upset that balance and cause ice ages. Milankovich was aware that this was just one of several factors, since it turns out that ice ages do not recur every 26,000 year, nor do they seem common in other geological epochs. The eccentricity of the Earth's orbit, which determines the closest approach to the Sun, also changes periodically, as does the inclination of the Earth's axis to the ecliptic. But overall the notion that ice ages may be linked to the motion of the Earth through space may be currently our best guess concerning the causes of ice ages. Postscript, 28 July 1999. The magnitude of the "Milankovich effect" depends on the difference between largest and smallest distances from the Sun. That, in its turn, depends on the eccentricity of the Earth's orbit, which varies with a 100,000-year cycle, on which a 413,000-year cycle is superposed. J. Rial (Univ. of North Carolina) found signatures of those cycles in the oxygen isotope content of deep-sea sediments, in full agreement with the Milankovich theory. His work is in "Science," vol. 285, p. 564, 23 July 1999; a non-technical explanation "Why the Ice Ages Don't Keep Time " is on pages 503-504 of the same issue. Further note: The sea-bottom results have now been compared to hydrogen isotope ratios in deep boreholes in the ice sheets of Antarctica, which took nearly a million years to accumulate (Science, 11 June 2004, p. 1609). Deep-sea sediments show that in the last million years, but not before, the variation is dominated by a periodicity around 100,000 years. Its origin, the article states, "is one of the unanswered, yet fundamental questions." Ice cores could help explain it. Because of the precession of the equinoxes, the position among the stars of the celestial pole--the pivot around which the celestial sphere seems to rotate--traces a circle every 26,000 years of so. The celestial pole is now quite close to the pole star Polaris, but it will not be so in the future, and wasn't in the past. The ancient Egyptians regarded as pole star the star Thuban or "Alpha Draconis," the brightest star (=alpha) in the constellation Draco, the serpent. For more information about the motion of the pole, see here and here. A review article, primarily for scientists: Trends, Rhythms and Aberrations in Global Climate 65 Ma to the Present (Ma is million years), by James Zachos, Mark Pagani, Lisa Sloan, Ellen Thomas and Katharina Billups, "Science" vol 292, p. 686, 27 April 2001. Goes beyond variations due to the precession of the equinoxes and also includes variations of orbit eccentricity, inclination between spin axis and the ecliptic and in the precession cycle itself. The periodicities that enter the Milankovich theory here. Also, look up "Milankovich" in Wikipedia. For serious scientific pursuits: A recent article in "Nature" applies the theory of Milankovich to Mars and concludes that its effects there were probably much more severe, in part because the presence of our Moon regulates the tilt angle of the Earth's rotation axis. See Recent ice ages on Mars by James W. Head et al., Nature, vol 426, p, 797-802, 18/25 December 2003. Questions from Users: Does precession mis-align ancient monuments? *** Does precession change the length of the year? and again: Does Precession of the Equinoxes shift our Seasons? *** Do astrologers use the wrong positions for the planets?